A week ago Little Miss and Buddy came out of their rooms after getting dressed and ran to me. Look at us… we’re twins! 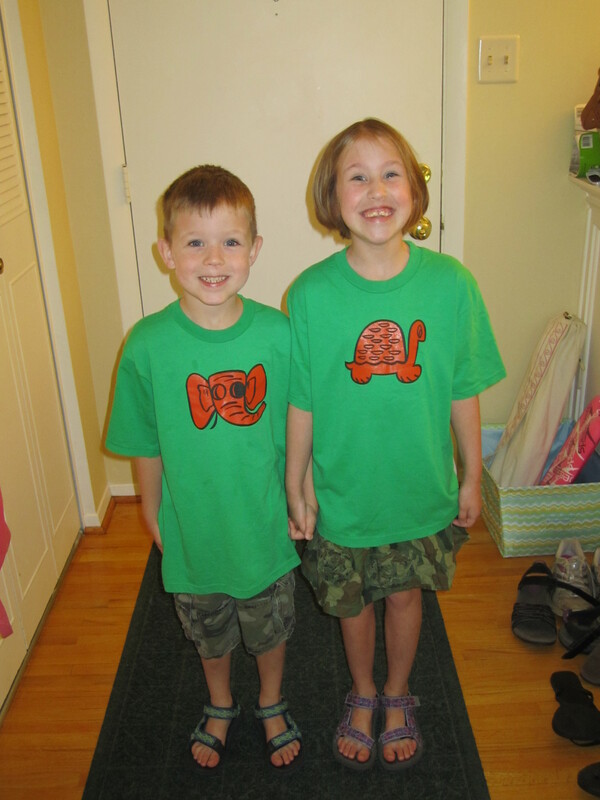 And indeed – they were dressed with similar green shirts and camouflage bottoms. I am not the kind of mom that likes a matchy family – in fact I’ve been known to change (or My Man has) if we’re wearing shirts that are similar colors, but my kids are not of my thinking. They often match each other or Little Miss will organize her outfit to match mine. It’s just one more way that lets me know that THEY are in control of themselves and I have no say in so many things. Little Miss and Buddy are very close. That closeness can be in months (there is 17 months to the day between them – they were both born on the 23rd of their month) as well as in relationship. Sure they fight like all siblings, but most of the time they genuinely like each other and play, play, play. I’m so thankful for that. As a family that moves every few years they are going to need that consistency of a built-in best friend – that someone they can count on to have their back when they enter a new situation with excitement and fear. I love to see how tight they are and I hope it lasts a lifetime. So, when my two kiddos come out of their rooms dressed as twins and say “take a picture of us mom,” and then proceed to get very excited about the idea of dressing like twins for a week my heart sings a little. “Mom, you can write a blog about it,” they say. I get into it and I take their photo in the pose they concoct of them holding hands and standing “straight like soldiers” because they are wearing camouflage and I get excited about all the possibilities that this week can give me for my virtual story telling. This photo was taken on a Sunday – and by Monday morning the idea to continue was already “BORING”. I was kind of bummed when they decided to not continue their twin quest – but I got a cute photo and an idea handed to me to write about so it all ends up good in the end.